What Kind of Doll Can Make the Police Destroy a Car? You're a police officer. You've just gotten a call that a baby's trapped in a hot locked car. The only reasonable thing to do is the break in to save the baby's life, right? Except when it's a doll. Embarrassing! 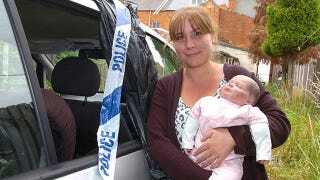 That's the situation police in Workshop, Nottinghamshire found themselves in after they broke into Victoria Cristofis's car thinking her daughter's "Reborn doll" was an actual baby. They really only lost £200 in damages to a vinyl infant. The creepy part is that you can't really blame them. Apparently, "reborning" is a thing, where you go to extra lengths to make a doll you already own that much more realistic. Umm.. That might explain why Cristofis will occasionally be approached on the street about her young daughter Chanel mistreating a child.